Riley’s Pour House is a secret place nestled along the Main Street of Carnegie. While the location has dawned many names over the years, the Riley’s invited in the TasteBuds to host the 26th Wine Exchange Dinner. 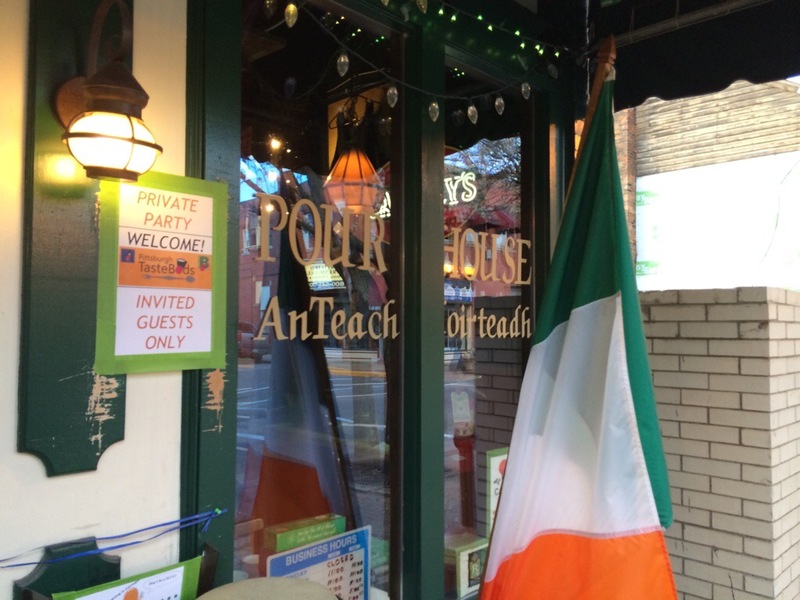 The event was the first-ever dinner featuring traditional Irish-cuisine. Chef Lloyd developed a special menu for the Pittsburgh TasteBuds dinner crowd to feature the best of his Irish dishes. Sharable appetizers included BLUE BAY MUSSELS and CHERRY STONE CLAMS with redskin potatoes, garlic and cream. Served with a garlic cristini and BAKED KERRY CHEDDAE HOUSE MADE COLCANNON topped with butter and fresh parsley, served with sweet soda bread. Immediately, as you might expect, guests commented on the presence of potatoes in both dishes – a staple ingredient in Irish cuisine. Many of the guests had never had Colcannon before. To my knowledge, Riley’s is the only place in the Pittsburgh area that serves Colcannon. Everyone was very surprised how well the potatoes and cabbage blended together into a unified flavor. The mussels and clams served in a cream sauce offset the heavier-appetizer nicely. For a second course, each guest was able to choose between a shanty salad or coleslaw. Both are offered on the regular Riley’s menu. There was additional surprise among the crowd when a slice of potato appeared in the shanty salad. Pictured below are the delicious entrees that were prepared. Each dish came out looking picture perfect. 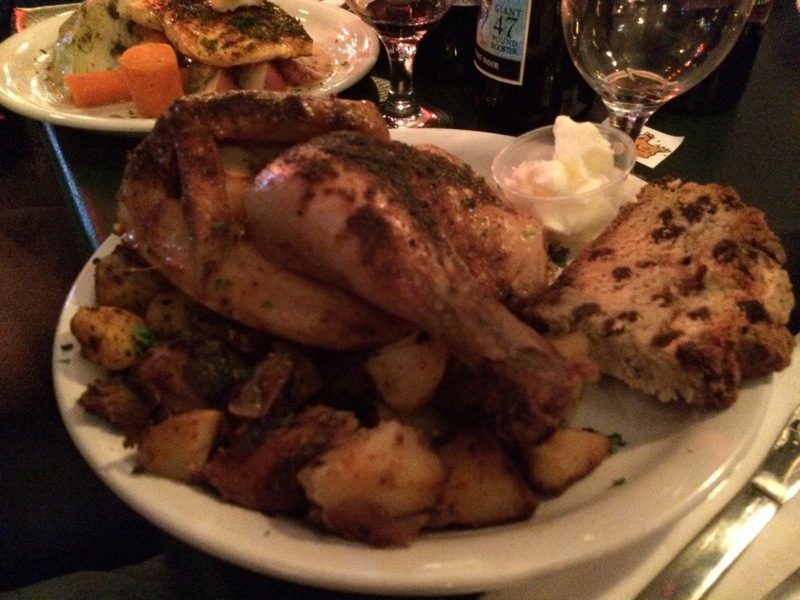 First, the ½ SLOW ROASTED CHICKEN that was served with roasted red skin potatoes, and sweet soda bread. This was indeed HALF of an ENTIRE fresh chicken. Every guests who ordered the chicken asked for a to-go box to take the chicken with them to savor later. 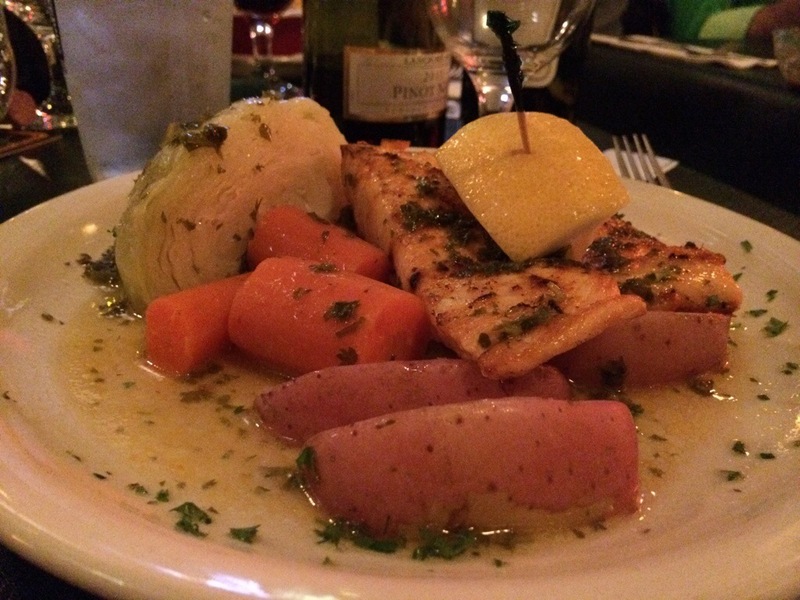 The BAKED SALMON FILET was served with steamed cabbage, carrots, and redskin potatoes. Some saw the dish as the “healthy” option, but were not disappointed by lack of flavor. It was interesting to see the large cabbage wedge appear on each plate. Steaming the cabbage is definitely an at-home preparation that I look forward to trying myself. 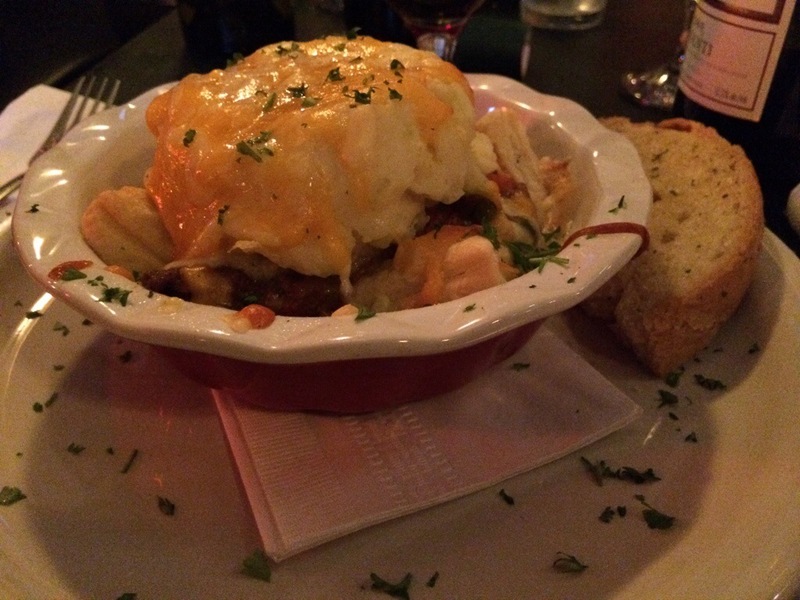 The EPICURIAN SHEPHERD’S PIE was traditionally prepared with ground lamb and ground Kobe beef, onions, celery, peas, carrots in a rich brown gravy. The mixture was topped with house-made colcannon. The dish was very savory and delicious. It was clear that Chef Lloyd took additional care in preparing each individually portioned dish. Unlike most wine exchange dinners, dessert was included as an added bonus for each guest. A selection of desserts finished each guest’s meal on a sweet note. The crowd was excited when Chef Lloyd emerged from the kitchen so praise could be given for his stellar performance. In my opinion, Chef Lloyd has become a small celebrity in Carnegie. His name is placed atop the brunch menu available at Riley’s Pour House during limited hours on Saturday mornings from 8:00 a.m. to 12:00 p.m. I, for one, look forward to trying his signature pancakes. Riley’s is not just a local watering hole, but a restaurant that can produce great food at the hands of Chef Lloyd.